The major principle of Wholistic medicine is the knowledge that health is not just the absence of illness but rather a dynamic state of energetic balance within us. This fundamental principle – that people live in a continuous, dynamic relationship to health and illness, yet always striving for the balance that signifies good health – is the foundation from which Wholistic Healing Arts practitioners assess and administer treatment. Traditional Chinese Medicine is perhaps the best example of wholistic medicine. 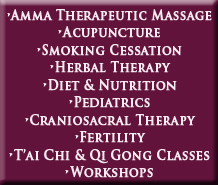 It consists of five branches or limbs: 1) acupuncture, 2) herbalism, 3) bodywork, 4) diet and nutrition and 5) exercise. All of these branches are concerned with preventative and therapeutic health care through the balancing of the energy system and the flow of the vital energy, or “qi” of the body. Proper flow and balance of this energy, which is the source of youthfulness and life, results from proper treatment, diet, exercise, relaxation, right aim and attitude. The improper flow and imbalance of the life force, however, can lead to illness. 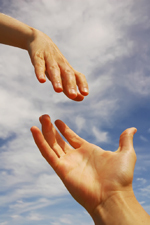 The services which we provide at Wholistic Healing Arts encompass the wholistic model. We are not simply concerned with relieving symptoms but with treating the underlying root causes of imbalance and dis-ease. By understanding the causes of disharmony and making dynamic changes and adjustment in the energy system, harmony and balance – good health – can be restored. Whether you are working to heal yourself or have decided to make wholistic health a part of your preventative care regime, we are your partners in achieving and maintaining your healthiest potential. Wholistic Healing Arts treats its patients with the following natural minimally invasive therapies – integrated for a truly wholistic approach to health care.